A New History of Christianity in China, written by one of the world's the leading writers on Christianity in China, looks at Christianity's long history in China, its extraordinarily rapid rise in the last half of the twentieth century, and charts its future direction. 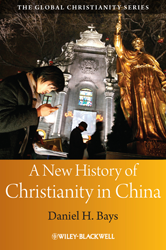 Provides the first comprehensive history of Christianity in China, an important, understudied area in both Asian studies and religious history. Traces the transformation of Christianity from an imported, Western religion to a thoroughly Chinese religion. Contextualizes the growth of Christianity in China within national and local politics. Offers a portrait of the complex religious scene in China today. Contrasts China with other non-Western societies where Christianity is surging.